How Does the Messenger Scam Work? First, you receive a Messenger message from a Facebook friend. You “know” it’s your friend by his profile picture in the message, right? Wrong. That’s an image that anyone can download and use for any purpose, including nefarious ones. Lulled by your friend’s face, you obligingly click on the link right underneath the message, which is short and to the point: “ Video.” What happens next depends on what browser you are using. Click on that “video” link while using Chrome and you will be whisked away to Google Drive. There you will see something like a YouTube video page complete with a control panel, a “Play” button, and in the background the comforting photo of your pal. What could go wrong? First, no YouTube page will ever ask your permission to install a browser extension, as this fake does. If you fall for that trick by agreeing to the “extension’s” installation you are, in fact as well as effect, telling Windows’ security to “go ahead and run this unknown program from an unknown source.” What happens next? The unleashed malware instantly sends Messenger messages to all of your friends; they are exactly the same as the phish that you received only with your profile photo instead of your friend’s. The vicious cycle of infection and re-infection continues. Users of other browsers are told they need to update Adobe Flash Player instead of a browser extension. That malware turns out to be adware designed to generate profits for the hackers. But that’s not all the damage this one little “video” link does! For Chrome users, the fake extension begins to monitor all of the sites they visit. When a victim visits Facebook and logs in, the extension steals those credentials and Facebook’s “access token” that gives apps temporary access to Facebook’s API (Application Programming Interface). These precious bits of data are sent back to the hackers. Let’s see how they are used. Have you ever seen a warning that an app wants permission to “access your contacts?” That’s what this malware is after with its FQL queries. It then quickly chooses 50 of your contacts at random from among those presently online, and sends that one-word bait, “video,” plus the link that starts the unholy chain of events all over again. Several teams of security researchers from all over the world joined together to stop this threat. But another like it will arise - many others, now that the modus operandi has been published. The next one may use bait more sophisticated than the word “video…” which, unless you have very taciturn friends, is a telltale sign that something is amiss. The moral: Be careful on Messenger, in your email inbox, and any other place where you are tempted to click a link before engaging your brain. No anti-virus software can protect from all known threats, especially the rapidly-evolving types of malware more common today. As I've said before, a simple phone call (or text message) to the alleged sender of a questionable link can confirm if it's bogus or benign. Most recent comments on "Just Say NO to Facebook Messenger Malware"
Just say NO to Farcebook, period. I fear it's gone well past the point of "video" in the subject line already. 3 times in the last week I've received Messenger videos with the caption "Is this you, Rick?" personally using my name to get me to click on the supplied video link. All three times it turned out my friends had been hacked in this manner. Rule of thumb, never click on any video links in Messenger. The Farce is with us, Lady F. I truly believe that I will have no success in changing my kids minds. It's one way that I keep up with them. I never click on links until I make that phone call. (If you're thinking of clicking, pick up the phone!) The last video I confirm was actually from one of my daughters. And my church has a closed group on FB. Oh, well. I have been on Facebook 2 times, and got a trojan each time. The last time, Facebook told me my 16 character login was not secure (upper and lower case, numbers and symbols), and I needed to change it. So as a test, I changed it to a name with 4 letters, 2 upper case and 2 lower case, with a 2 digit number. Facebook said that was great. That proved my point. I set the new password, logged out, did something else for 15 minute4s, logged back in with the new password and canceled the account. That was about 5-6 years ago. I have not been back and don't miss it. In addition, I am on no other social media sites, and won't be. If I lived next door to you, you would not tell me where your spare key is hidden, your checking account number, and when a where you are goimg on vacation. But you would post it on Facebook thinking that only your "friends" can see it. It is my opinion that most social media and the ways they are are used are dangerous. Now they offer a messaging app for kids! When will we learn?? Also, I regularly get junk emails through my Microsoft email account with a subject of "Is that you (insert any name you wish)?" That is in addition to the ones for Canadian drugs and hot foreign women looking for husbands, etc. I immediately delete them. I received the same one asking if this was me and I clicked on the youtube video. So far I've not heard of anyone getting messages from me but are there anyway I can tell if any thing remains on my puter? I remain on Facebook for only two reasons: to follow my niece's softball games and to search local shelters for a dog. That's it. Never trusted Facebook, and its censorship and ultra-liberal sidebar "news" has become sickening. For me, the easy way to limit exposure is to not use social media. Family and friends know I can be reached by phone, SMS or e-mail. In the case of both Google and Facebook, three talented students in their 20's came out of obscurity to establish multi-billion dollar enterprises. Do you suppose they had some help? More reasons not to use Facebook, Facebook Messenger, Google, and Chrome. Good, old fashioned email works just fine for keeping in touch. Plus, there are plenty of great alternatives for browsing and searching the net. Why follow the "herd" and get slaughtered? Like LadyF, you sure piqued my curiosity with the first 4 words of your subject line. However, I knew better to think/hope that the fifth word of your subject line would be "google". I strongly feel that google is the biggest invasive species in the universe. I plan to purge my (last remaining) gVoice account; so that I could permanently lead a life w/o google-anything. It is not going to be an easy feat since WindowsPhones are no longer a viable alternative to this google empire. Even then, majority of those whom I contact is using an Android phone; making my plans nothing but a pipe-dream! @RandiO I totally agree with you about Google's evasiveness! I avoid anything Google, such as Google Search (I use Startpage), GMail, Chrome browser, etc. like the plague. I agree with others about not depending on Social media to communicate with friends and family. Telephone, email, and snail mail work just fine for me. I don't even have a smart phone, partially for privacy reasons (also because I'm retired on a so called fixed income and don't "need" that monthly data bill). I do have a dumb as rocks flip phone that has the GPS, text messaging, and voice mail disabled. I turn the phone on only when I'm going to actually use it, which is rarely. @JR Who's in charge in your family? You or the kids? If they refuse to stay off Farcebook, take away whatever is necessary to drive the point home, such as their phones, computer privileges, ground them, etc. On my previous post, evasiveness was supposed to be invasiveness (I plead Senioritis). Facebook invades your browser to look at your browsing history, then targets you with ads that reflect that interest. I avoid this by using a separate browser (Opera) only for Facebook. Facebook also cynically take money from advertisers of blatant snake oil products, magic potions and cure-all jollops. A disgraceful business ethic. Here, Here Just say no to Facebook. Fake living ! Some still use it between friends (real friends) but like every other thing that is built on trust it is now under attack by people with now moral code or concern for others. It isn't if you will be screwed by association with Facebook, just when. I've received all these things and more but have a code that I follow. Much the same as mail or phone fraud scams. Hang up and call the person or go to your email and email the person or your friend list etc. and ask them wtf they are sending this crap for if it was them and if not then tilling them they have been hacked. Unfortunately most people getting your posts already know better. Its the sheeple that fall for these things. As Bob Deloyd says "be vigilant and don't be stupid". Should you stop driving because you might have an accident? Have you stopped taking medication because it might have harmful side effects? No, you've learned to manage all kinds of safeguards in everyday life. I value the connection to friends and family Facebook provides, and I'm smart enough and vigilant enough to be safe. It's your responsibility, don't think someone else is going to do it for you. 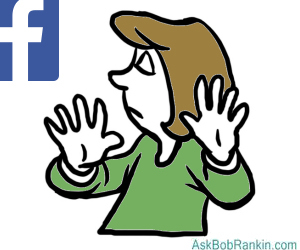 Pay attention to Bob Rankin, it's the best help/instruction you're going to get. Thank you Bob Deloyd and Sally. For a minute I thought every post was going to be of the "get off my lawn" type. I'm glad to see there are people that do find social media for what it is. We all need to be careful in everything we do. I also thank Bob Rankin for the service he is providing to the online community. I rarely use Facebook & I never use Messenger. It's more trouble than it's worth to go from my regular e-mail & log into Facebook to get a message. Those who know me know my regular e-mail & they can contact me that way or not at all.